In terms of product type, the baby car seat market is divided into infant seats, booster seats, combination seats, and convertible seats. The booster seats segment accounted for the largest share of the market in 2017, followed by convertible seats. Booster seats have set cushions that raise the child’s sitting position in the car allowing the car’s seat belt to fit properly. Seat boosters are used for children in the age group of four to twelve years. The booster seats segment is bifurcated into high back booster seats and backless booster seats. Car seats are primarily made from hard plastic, which can become brittle and unsafe over time due to weather and use. Rust can form on metal parts in unseen areas and affect how the seat performs in a crash. Most car seats last for six to ten years; however, car seat expiration dates vary by manufacturer. Different types of car seats are used as the baby grows, therefore the car seat is utilized for short period of time. If this requirement passes into a law, parents would be required to buy a minimum of four child car seats to match the age categories of their child until they turn 14. This is likely to further reduce the lifecycle of baby car seats. In terms of distribution channel, the online channel segment is anticipated to expand at a rapid pace during the forecast period. The online platform is gaining popularity as ordered products are delivered to the people right at their doorstep. Consumers can compare prices of different products on various websites and can choose from an array of the options. Online shopping websites also offer free shipping, home delivery, on-time delivery, and easy exchange and return. These factors are increasing consumer preference for online shopping as compared to traditional shopping or offline distribution channel. In terms of geography, the baby car seat market is segmented into North America, Europe, Asia Pacific (APAC), Middle East & Africa (MEA), and Latin America. Europe dominated the global baby car seat market accounting for market share of more than 30% in 2017. The region is expected to continue to dominate the market during the forecast period, followed by North America. Rise in the number of car accidents across the globe have encouraged several countries to pass laws making baby car seats mandatory to ensure children’s safety. Some of the leading players operating in the global baby car seat market include UPPAbaby, Renolux France Industries, RECARO Holding GmbH, Newell Brands Inc., Mothercare plc, KiwiBaby, InfaSecure, Jane Group, Goodbaby International Holdings Ltd, Dorel Industries Inc, Cosatto Ltd, Clek Inc, Britax Group Ltd, BREVI SRL, and Artsana Group. The market overview section of the report provides dynamics and trends that influence the current nature and future status of this market. An attractiveness analysis has also been provided for every geographical region in the report to give a thorough analysis of the overall competitive scenario of the baby car seat market. Moreover, the report provides an overview of the various strategies adopted by the key players operating in the baby car seat market. Product definition and introduction chapter helps understand the various types of baby car seat used across all regions. The global baby car seat market has been segmented based on product type, distribution channel, and region. In terms of product type, the market has been divided into infant seats booster seats, combination seats, and convertible seats. The booster seats segment has been further bifurcated into high back booster seats and backless booster seats. Therefore, the report provides in-depth cross-segment analysis of baby car seat and classifies it into various levels, thereby providing valuable insights at macro and micro levels of the market. Based on distribution channel, the baby car seat market has been segregated into online and offline. The offline segment is further categorized into supermarkets & hypermarkets, specialty stores, and others. 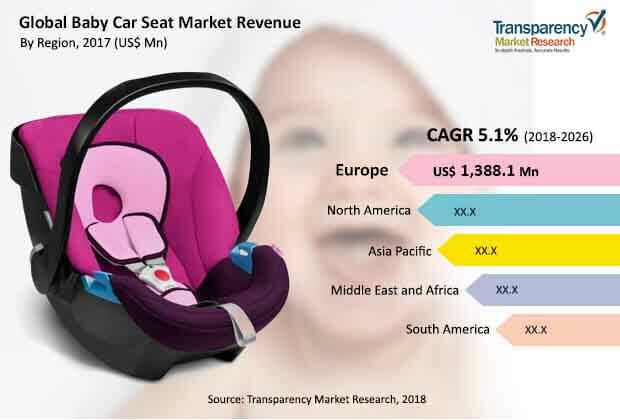 The report also highlights the competitive landscape of the baby car seat market, thereby positioning all the major players according to their geographical presence and recent key developments. In competitive landscape, the report also includes a detailed study of the top market players. The comprehensive baby car seat market estimates are the result of our in-depth secondary research, primary interviews, and in-house expert panel reviews. In terms of region, the baby car seat market system market has been categorized into five major regions and key countries in the respective regions is segmented into North America (the U.S., Canada, and Rest of North America), Europe (Germany, the U.K., France, and Rest of Europe), Asia Pacific (China, Japan, India, Australia, and Rest of Asia Pacific), Middle East & Africa (G.C.C. Countries, South Africa, and Rest of Middle East & Africa), and South America (Brazil and Rest of South America). This report provides the essential information required to understand the baby car seat market. Furthermore, Porter’s Five Forces analysis explains the factors that are currently affecting the market. Some of the leading players operating in the baby car seat market are UPPAbaby, Renolux France Industries, RECARO Holding GmbH, Newell Brands Inc., Mothercare plc, KiwiBaby, InfaSecure, Jane Group, Goodbaby International Holdings Ltd, Dorel Industries Inc, Cosatto Ltd, Clek Inc, Britax Group Ltd, BREVI SRL, and Artsana Group. The report also offers competitive landscape of the key market players.